...a hub for sports criticism and analysis. Life is full of four-letter words. Some are pleasant; others, not so much. What I can say about four-letter words, or words with any number of letters for that matter, is that they have to be read or heard in context. There may be universal perceptions of words, but most words usually carry more depth than their face value lets on. Hate. "Hate is a strong word," is a common response to the word's use. "You're such a hater," is also a common response used to call someone out for being openly critical. Hate is a four-letter word that carries a lot of weight, but also a lot of complexity. Not unlike "love," hate communicates an extreme end of the emotional spectrum. That said, it also communicates the next level of the word "dislike." Think about it - you can love your spouse, pizza, USA Soccer, and your co-workers, but all in different capacities. Well, shouldn't "hate" have the same elastic clause available to its use? Hating can be evil, malicious, dark, and poisonous; but it can also be entertaining, communicative, and fun. In fact, my message is about just how valuable hating can be in creating healthy and interesting competition. I hate LeBron James, New York hates Boston, I hate VCU basketball, Madison Square Garden hates Reggie Miller, I hate Derek Jeter, and Bears fans hate Packers fans. None of the above indicates a hope, wish, or desire for neither injury nor physical harm; rather, it describes the fanatical desire for competitive failure or struggle. The sad thing is that in our current culture of "spreading the wealth around," over-sensitivity, pampering, and argumentative twenty-somethings with active social media accounts; healthy hating has become a crime. This crime is usually portrayed through an accusation of "drinking the haterade." A crime I'm happy to say I've committed plenty of times (as admitted above). As an avid sports fan, my advocacy is for all of us to be able to hate in peace. All's fair in love and war right? So let the Sox hate the Yankees and the other Sox hate the Cubbies, let me hate Derek Jeter because he got drafted in the right place at the right time and owes the Yankees more than they owe him. Let the Garden hate Reggie for all those clutch 3-pointers, and let Maryland fans hate JJ Redick for how money he was with that jumper (ok, it was a little harsh, but even he was smirking during those foul shots). Let the Tide roll with hatred when they line up against Auburn in the Iron Bowl, and let Navy hate Army every December. 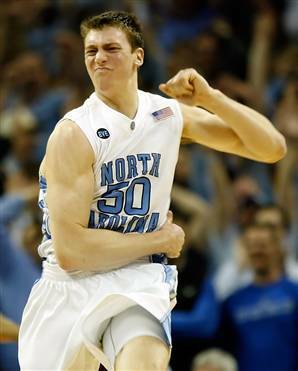 Let Duke fans hate Tyler Hansbrough's childish and whiny face, and certainly let Cleveland Cavs fans hate LeBron for the selfish, attention-seeking stunt he pulled in July 2010. Hating is what makes fans (short for fanatics!) that much more passionate about purpose, rivalry, and high-stakes encounters. But I beg you to hate realistically, because there is absolutely a threshold of moderation. Please, please, please, never hate the way that Dodgers fans did to Bryan Stow in the parking lot, and never ever hate the way that Harvey Updyke did to those oak trees in Auburn. The people who abuse the moderated zone of hatred, turn it into the evil word that we know it to be, and shouldn't be imitated or excused. The abusers of hate however, as with most things, are in a minority and are not representative of everyone else. That's not to say that there is no space for disapproval in sports either though. In fact, for me, below the people who I "hate on" for fun, are the people that I "can't stand" for legitimate reasons. The two that jump to mind involve the last two Super Bowl champions. I couldn't stand watching Ray Lewis be glorified by the media and then hired by a Disney company, after being an accomplice to murder a decade earlier (innocent until proven guilty at its best). And I also couldn't stand Pete Carroll being glorified as a "great man" for leading the Seahawks to a championship, but it being taboo to mention how he left the USC Trojans in shambles, particularly the student athletes who paid the price for his wrongdoing. I may be criticized for my opinions on the things that I can't stand, and that's fine, but that's not haterade, that's trying to bring awareness to sad realities...and if you think it's just a case of me "hating" the Ravens or the Seahawks winning, you are sadly mistaken. I loved seeing O.J. Brigance win that trophy, and seeing Russell Wilson perform at the highest level. To be honest, I can truly say I am thankful for the players who have allowed me to hate for fun. Thank you LeBron, for not being Ray Lewis, and just being someone I could root against on the court and laugh at your childish TV special. Thank you Rex Ryan for not being Pete Carroll, and just being an over-confident, foot-loving coach who I could make fun of because you were in my division. You see, any true sports fan knows that haterade is part of the game, and it makes it fun. And the best case scenario is that you never have actual reasons to hate somebody, rather, just an annoying player that you can hate like you hate Mondays. Just because some people taint the use of alcohol, do you stay sober? Just because some people drive recklessly, do you always hold the needle on the speed limit? And just because some people hate with evil, does it mean that you can't pour passion into your fanhood? I certainly hope not. So don't go around chugging haterade beyond reason, but I'd hate to see all the fun you'd miss out on if you didn't at least take a moderated sip. It was Saturday, April 28, 2012 when the city of Chicago froze. With 1:22 left in Game 1 of the NBA Playoffs against the Philadelphia 76ers, the whole city held their breath. And after Derrick Rose tore his ACL in that moment, as the city now anxiously awaits his return, some fans still haven't exhaled. © 2013 Christopher F. Inzirillo. All rights reserved. Picture Window theme. Theme images by sandsun. Powered by Blogger.